This is a quick creative writing exercise that I've used with great success for a number of years. 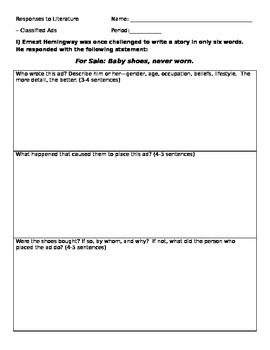 Based on Ernest Hemingway's famous six-word short story ("For Sale: Baby Shoes, Never Worn"), this task begins with a brainstorming, analysis, & discussion of the story behind Hemingway's text, then asks students to interpret a classified ad given to each of them, and generate the story behind the ad. 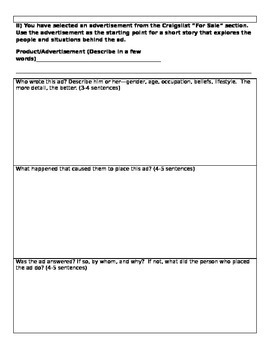 This could be split into two mini-lessons (one on Hemingway, one on the differentiated classified ads), or it can just be used with the ads. If you're looking for a fun conversation starter and creative writing exercise, this is a great one. 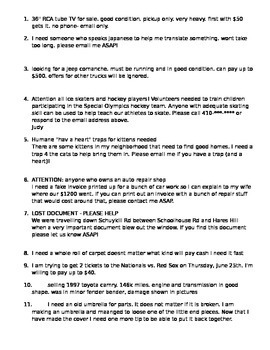 Download includes a three-question response sheet to Hemingway's story, another sheet applying those questions to a classified ad, and a set of 25 sample classifieds. 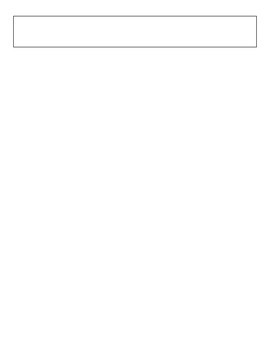 You can also easily add your own classifieds if you prefer, or even have students write classifieds, exchange, and interpret their peers' ads!